The eyes appear to be hand painted and possibly glass. Item Included: 1 Gargoyle statue/ sculpture. Perfect for new or veteran collectors, whether hung on a garden wall or displayed flat with your other Gothic collectibles. If there are any problems with your order. Artist Manchester created our gargoyle sculpture to be a foot tall and cast it in quality designer resin with a two-tone, faux stone finish. Looking for more uniquely distinctive gifts ideas?. Reminiscent of the grotesque Gothic faces in the weathered stone facades of Oxford University, this eerie grotesque Gargoyle continues a rich tradition of quirky and quite entertaining stonework. 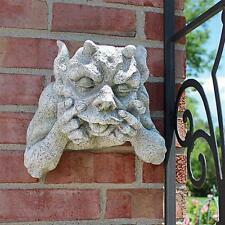 Our own Gothic gargoyle is actually cast of quality designer resin with a grey stone finish. A very unique, heavy shelf. Feel like it weighs over 20 lbs. Pulled from an estate sale of a old hippie/ biker's house, possibly from the 1960's or 70's?. Gargoyles have long been used to decorate gardens and flower beds. The Gargoyle is made of solid resin and Hand Painted. made in the USA. Can be used indoor & outdoors. (PERCHED DRAGON. Shelf or computer sitter. Coke can not included :). DARK GRAY & GREEN /ANTIQUE BRONZE LOOK - MADE OF PLASTER. With powerful shoulders, craggy claws and a death grip, the mythical gargoyle Clutch will protect his mystic orb from savage barbarians and wyverns -or die trying! 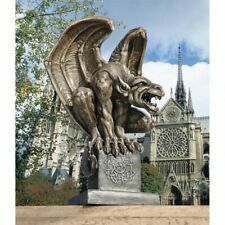 Sculpted with the wings of a Gothic guardian and the muscular haunches of legendary mythical beasts, this collectible gothic gargoyle statue is cast in quality designer resin. Gargoyles have long been used to decorate gardens and flower beds. The Gargoyle is made of solid resin and Hand Painted. Can be used indoor & outdoors. Paperweight Signed 3 ". very cool piece great for the troll collector. Watch our gargoyle claw his way to the top! Bird Dragon Gargoyle in Greystone. Gothic Guardians. Design SG-125 - 1999. This statue features a gargoyle crouching and holding a shield. Plunkvoot's Ark. "The Ark that didn't make it". Artist Dennis Liberty's whimsical parody of the Noah's Ark Bible story. Hudson Pewter. They are no longer in production since Hudson Pewter ceased operations on Jan. 4th, 2000. The statue has a date of 1996 signed on it along with the artists signature and makers mark. Great for any Goth collector. Guardians of the roof these miniature gargoyles will protect your fairy garden or fairy house. Model: 10330. This artist is well versed in the history and lore of these fabled creatures, spared no detail in the exquisite sculpt or intricate hand-painting. This gothic guardian in quality designer resin. Height of the gargoyle is 22". Estate Sale Find! Nice Wall Gargoyle. It appears to be a plaster type material. There is a chip along the bottom of the piece. 7" tall and 4" wide. Griffin Sculpture. Made of Cold Cast Resin. VINTAGE MYTHICAL GARGOYLE WALL SHELF. 13" WIDE BY 9" TALL. SOME CHIPS IN BLACK PAINT. MADE OF CHALKWARE/PLASTER. PERFECT HOLIDAY GIFT FOR SOMEONE WHO LOVES UNIQUE GIFTS. Cast in quality designer resin, this gargoyle is finished in Gothic green tones. So lifelike this ferocious warrior! By artist Liam Manchester. He doesn't care HOW. GARGOYLE COLLECTION STONE SENTRY FIGURE INTERNATIONAL RESOURCING ABOUT 4" TALL. Has sat on a shelf since it was purchased in 1996. Zoom pictures for details of this interesting piece. Message if there are questions. Vintage Mythical God Gargoyle Gothic Art Deco 1930s Necklace Amazing Piece!! He's a gargoyle! He's a dog! He's a delightful hybrid of the two! Looking for more uniquely distinctive gifts ideas?. Cathedral Gargoyle Statue. Looking for more uniquely distinctive gifts ideas?. Detail is Fabulous. One wing is slightly bent down. It’s normally. See my other lots. Maybe you will find what you were looking for! Weight - about 300 grams. VERY GOOD CONDITION, NO ISSUES.6.5" X 6".LOOKS TO BE MADE OF A HEAVY RESIN TYPE MATERIAL. Winged Dog Faced Gargoyle. Gray In Color. This gargoyle kneels in servitude holding a beacon of light in the darkness. He is the ultimate protector of the master's realm, feared by all evil spirits. This Gargoyle Candle Holder is made of designer composite resin, hand painted and polished. This gothic guardian creature of the night defends the ancient cathedral of truth. He is a warden of the saints, keeping evil spirits out of the vicinity. This Guardian Gargoyle Statue is made of designer composite resin mixed with crushed stone, hand painted and polished. Porcelain Stone Finish Gargoyle. Condition is Used. Shipped with USPS Parcel Select Ground.